Aluminium phosphide is marketed in India under various trade names (Alphos, Bidphos, Celphos, Chemfume, Delicia,Fumigran, Phosphotek, Phosphume, Phostoxin, Quickphos, Synfume, etc.). · Aluminium phosphide is marketed in India under various trade names (Alphos, Bidphos, Celphos, Chemfume, Delicia,Fumigran, Phosphotek, Phosphume, Phostoxin, Quickphos, Synfume, etc.). · It is generally available as greyish green tablets of 3 grams each, mixed with urea and ammonium carbonate (Fig 8.5). These tablets are sold in sealed, airtight containers of tens and twenties. Each tablet liberates 1 gram of phosphine. · Grain preservative: Aluminium phosphide is said to be themost ideal grain preservative since it is relatively cheap while being very effective in repelling pests. The required number of tablets are removed from the airtight container and placed among the grain. On exposure to moisture, phos-phine is released which percolates among the grain. When fumigated grains are subsequently well aerated, phosphine evaporates rapidly leaving behind virtually no residue. Traces of phosphite and hypophosphite of aluminium may be present, but they are non-toxic. When exposed to air and moisture, aluminium phosphide liber- ates phosphine which causes multi-organ damage. · Common presenting symptoms include metallic taste, vomiting, garlicky (or fishy) odour of breath, intense thirst, burning epigastric pain, and diarrhoea. o Tachy/bradycardia, and ECG abnormalities: sinus tachycardia, sinus arrhythmia elevation, atrial fibrillation, T wave inversion in V5-6, sinus arrest, chaotic atrial pacemaker, complete heart block, bundle branch block, and ventricular premature complexes followed by ventricular tachycardia. o Massive focal myocardial injury with elevated­ serum levels of cardiac enzymes may occur. · Convulsions have been reported in some cases. Coma supervenes in later stages. · Hepatic damage, renal failure, and metabolic acidosis are possible. · Respiratory distress is invariably present with cyanosis, and cold, clammy skin. · Garlicky odour in the breath. · Urinalysis may reveal occult blood, bilirubin, glucose, and albumin. · Liver function tests are often abnormal. · Blood urea and serum creatinine are usually higher than normal. · ECG changes (mentioned under Clinical Features). i. Breath test: A piece of filter paper impregnated with 0.1 N silver nitrate solution is used in the form of a mask through which the patient is asked to breathe in and out for 5 to 10 minutes. Blackening of the paper is indicative of the presence of phosphine in the breath, since silver nitrate is reduced to silver on exposure to it. Similar reaction is also produced by hydrogen sulfide. ii. Biological sample test: A small amount of gastric apirate(5 to 10 ml) or minced tissue (5 to 10 gm of liver)* is taken into a steam distillation flask to which an equal quantity of water is added and then acidified with dilute HCl or H2SO4, followed by heating upto 500C for 15 minutes. The distillate is collected in an ice cold receiver containing 5 ml of 1% silver nitrate solution by dipping the adapter into it. If phosphine is present, the solution will turn black. For confirmation, add 5 ml of concentrate.HNO3 to the black precipitate and boil till the solution becomes clear. Then add 5 ml of ammonium molyb-date solution and heat for a minute. Formation of a yellow precipitate confirms the presence of phos-phine. A variation of this test involves placing 0.1 N lead acetate filter paper over the mouth of the distillation flask containing the sample (prepared in the same manner as detailed above). The flask is heated for 15 minutes at 50oC. Phosphine will blacken the silver nitrate paper, while hydrogen sulfide will blacken both papers. · Emesis is not to be induced. Though there is often intense thirst, do not administer water since whatever aluminium phosphide is still remaining in the stomach will react with it, releasing phosphine. For the same reason, stomach wash is contraindicated. While activated charcoal can be administered, it should be mixed with sorbitol (and not water), using 240 ml for every 30 grams. However, some authorities recommend the performance of gastric lavage as well as the administration of activated charcoal using aqueous solutions. · While there were initial reports eulogising the efficacy of magnesium sulfate, particularly in relieving cardiovas-cular manifestations, later studies could not sustain such view. i. Management of circulatory shock with IV fluids (4 to 6 L over 6 hours), while monitoring the central venous pres-sure and/or pulmonary wedge pressure. Dopamine can be given IV at a dose of 4 to 6 mcg/kg/min (maximum 10 mcg/kg/min). ii. Management of respiratory distress with 100% humidi-fied oxygen, intubation, and assisted ventilation. iii. Management of metabolic acidosis with sodium bicar-bonate (50 mEq/15 min) until the arterial bicarbonate rises above 15 mmol/L. iv. Control of convulsions with anticonvulsants (benzo-daizepines, barbiturates, etc.). v. Magnesium sulfate therapy*: Magnesium sulfate issaid to be beneficial in the management of cardiac arrhythmias. Conventional antiarrhythmic drugs such as digoxin and lidocaine are ineffective. o Magnesium sulfate is given IV as a 3 grams bolus, followed by 6 grams infusion over 24 hours for 5 to 7 days. o Alternatively, 1 gram can be given IV to begin with, followed each hour by the same dose for 3 consecutive hours, and then 1 gram every 6 hours for 5 days. · Ranitidine 50 mg IV 8th hourly to counter the severe epigastric pain. · There is widespread hypoxic organ damage with congestion and petechiae. · Contents of stomach are often haemorrhagic with mucosal shedding, and there is usually an intense garlicky odour. · Microscopy reveals necrotic changes in liver and kidneys. · Heart shows features of toxic myocarditis with fibrillar necrosis. · Lungs may demonstrate evidence of ARDS (adult respira-tory distress syndrome) with or without pulmonary oedema. 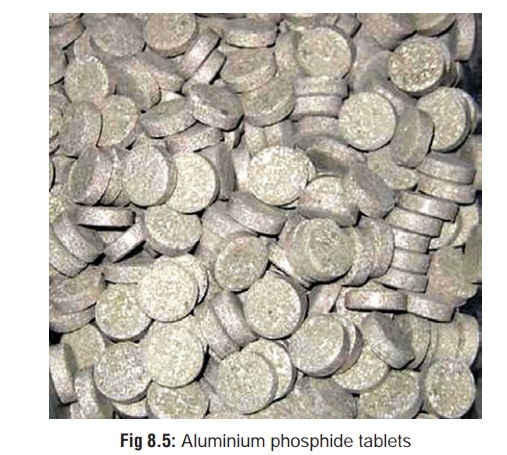 Prior to 1980, aluminium phosphide poisoning was virtually unreported in India. Today it is the leading cause of suicidal (and sometimes accidental) death in northern Indian states such as Punjab, Haryana, Uttar Pradesh, Madhya Pradesh, and Rajasthan. Southern states have so far not been signifi-cantly affected since aluminium phosphide is yet to make inroads into the agricultural sector here. But there are ominous indications of a gradual rise in the number of cases being reported.